Remember this little drama queen? Well… she’s back. From the vantage point of a Diana F+ who is infinitely jealous of LC-A, a well known favourite of Conny’s. Unfortunately, their relationship has gotten even worse, now that old LC-A (the broken one) has been replaced by a slightly younger model. Ouch. We’ve been together for what – over 4 years now? You used to look forward to go shooting with me. You used to be excited looking at my little plastic snout. And now? Nothing. Not a spark, not a twinkle, all gone. All you feel is resignation, and all I feel is negligence. Should we part ways? Are you taking the road less travelled by, leaving me for the grass to grow over? I don’t think I like you anymore. I see you when you look at my sisters. Diana Metropolis, I know she’s way more prettier. Cheap imitators. Never forget that I’m the original. Black and cyan, these are my colours. Yet you felt compelled to tape me over with an ugly red streak, writing your fancy stage name on it – as if you could look up lomoherz in the phone book in case of losing me! But would you even try to have me back? Notice that I’m gone? – Remember the good days? And then you left me on the shelf with nothing left to burn. Admit it – you didn’t know what to do with me right from the start. You couldn’t be bothered to learn all the medium format ways. 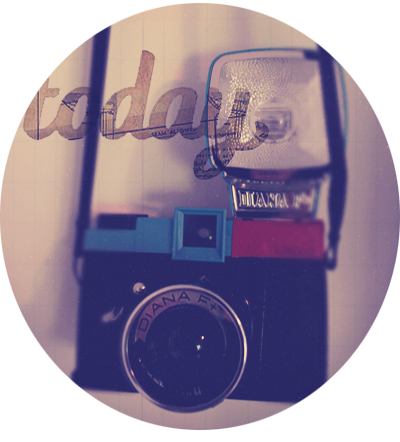 (And by the way, who doesn’t know about Cross-Processing – and you call yourself a lomographer?) And while LC-A was gone *sigh, all you needed was a substitute. Let me tell you something, missy: I feel USED. Just like that bloody tea towel next to the sink. It has always been about her. It was LC-A you took with you on your trip to Malta, passing through Italy and travelling to Egypt and Cyprus. Trust me, I wouldn’t have left you with a broken rewinder on your first week there! For lomo’s sake, she left you to rely on your cheap camera phone for the rest of your stay! Yet you were mourning her for over a year – pathetic. And all the while you were up and away? You left me in a dark box stuffed under your bed, where I had to endure creeping mould and scream-jumping Kids on top. But you never see me complaining, I never complain. If my chest had been a cannon, I would have shot my film upon it. Oups! Fire under your roof! Hehe, oh yes! Hey, there is a Diana Mini called Noir – do you have one? Connie, I had no idea that there was a Diana Mini. I did a search and found the dreamy 35mm Diana and realized immediately that your story telling noir is made to reflect your timeless appeal! I hope you are In a good place at the start of summer! I look forward to your imaginations. If I’m slow to reply, I apologize. I’m in deadline mode for Fall. Crazy right! Fall? I just too want to enjoy the summer…which just started. Cheers Connie, to a summer of joy :). Allyson.